It is a reviewer’s heaven when they come across so unlike everything else they have heard that they feel really challenged. This is the case with Gulaggh, a band that is the logical continuation of Stalaggh, a mysterious collective consisting of unnamed musicians from the Dutch and Belgian black metal and electronic ambient scenes. 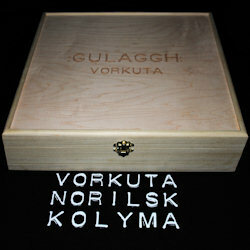 Stalaggh released a trilogy of albums consisting only of single songs, and then disbanded to become Gulaggh, who have also planned a trilogy of experiments in anguish named after Soviet prison camps, or gulags. The supplementary letters GH stand for “global holocaust”, just like with Stalaggh who were named after the German concentration camps. Vorkuta was initially released in 2009 and is now available on vinyl, although the three quarter hour long track must be broken up to fit on the two sides of an LP. What is new for Gulaggh is that they did completely without electric instruments and instead focused all their attention violins, trumpets, saxophone, etc. As one of the band members works in a mental institution, they even got the permission to use the inmates as the vocalists on the album. In the past, Stalaggh worked already with a convicted murderer of his own mother, and someone who committed suicide shortly after the release on an EP on which he “sang”. This time we get a whole bunch of mental patients an thirty children from a youth mental asylum. This first part of the trilogy consists, as I mentioned before, of a single, album-filling track, and honestly, this can’t be called music in the traditional sense of the word. There is no underlying structure or rhythm, and I am not even sure if the musicians know how to play their chosen instruments, but frankly, I couldn’t care less. The music sounds like a bizarre crossection between free jazz and avant-garde classical music, with total atonality at its root, and all performed with the evil outlook of a diehard black metal band. The voices are haunting, screeching, full of pain, longing, fear and utter confusion. The only thing approaching this slightly is Celtic Frost’s masterpiece Danse Macabre, but Vorkuta is even more uncompromising and unrelenting. This is an uttermost spooky rollercoaster ride through the darkest depths of the human psyche once it has lost contact with reality. And the best, or worst, of it is its authenticity. Once you realise that none of this is faked, you feel a sense of guilt, as if enjoying some kind of snuff movie. I don’t know if this is exploitation of mental patients or giving them an outlet for their twisted emotions, but it sure does take guts to pull something like this off. At first I wanted to leave this album with my total support and recommendation, but without an actual grade, but then decided that it does deserve the maximum of ten points. This is something totally different, maybe not really enjoyable, but without a doubt incredibly fascinating. I am already looking forward to the next two parts of this trilogy.